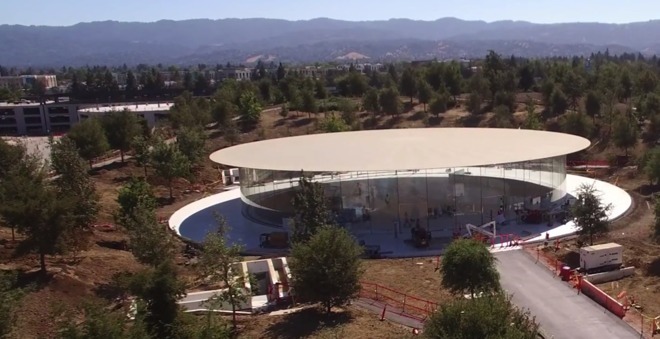 One of the last sets of drone footage while Apple Park is still under construction highlights the ever-growing landscaping taking place, and a close-up of the uncovered Steve Jobs Theater. The interior of the "spaceship" greenery looks to be near complete. A large portion of the heavy equipment has been removed from the site, with only one crane remaining out of the eight seen in previous videos. Some of the climate controls appear to be functional, with fans spinning. While some reports claim that there are workers in Apple Park now, nothing other than functional climate control systems suggests that. Before the massive construction effort started, the area was Hewlett Packard's land, and was essentially completely paved over. Apple's demand for trees is reportedly putting pressure on the local market, forcing contractors to source from outside California. The final tree count is expected to approach 9,000, with apple, apricot, cherry, and persimmon trees dotting the landscape.